Lab members adjust the arms on the robo-nurse, TRINA, during the Duke Robotics Student Symposium on April 14. The Duke Robotics lab was bustling with activity. In one corner, a small box-shaped robot was scooping up a ball and lobbing it high into the air for students to catch, its gears turning with each catapulted launch. Other guests watched as a black drone hummed through an obstacle course, diving up, around and through hula hoops positioned around the stage. Graduate students observed its progress in a glass enclosure, sporadically clicking keys on their computers. 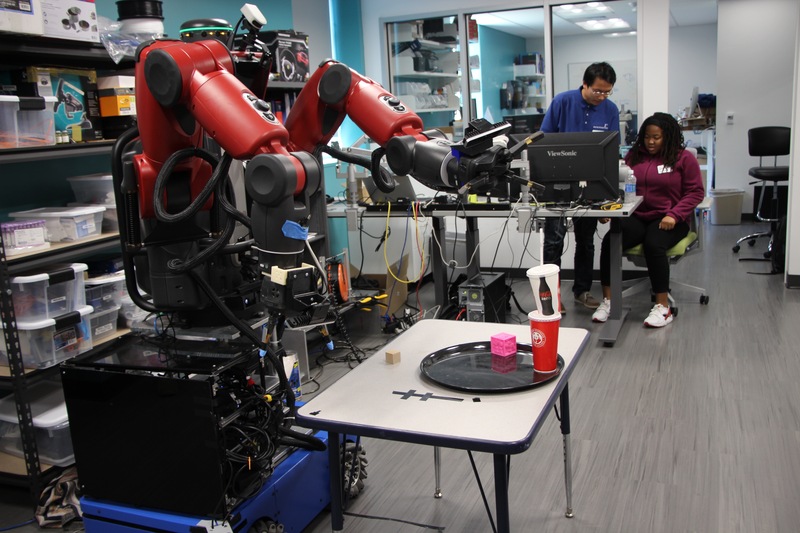 In another section of the lab, a large red robot was stacking paper cups while a lab member carefully directed its movements with a controller. The robotics lab typically offers a dynamic work environment, but this time the additional activity was due to the second annual Duke Robotics Student Symposium, where over 100 Triangle-area high school students, undergraduates and graduate students came together to learn more about the variety of robotics-based projects at Duke. The event, held on April 14 to coincide with National Robotics Week, featured presentations from Duke faculty members and graduate students, robotics demonstrations, and special guests from industry and the North Carolina Department of Transportation, all to showcase the expanding opportunities in the fast-moving field. Some of Duke’s leading roboticists shared how they were working to fulfill this goal through a variety of applications, with research that ranges from the roadways to operating rooms. Kris Hauser, director of the Intelligent Motion Laboratory, showed the audience videos of his lab’s ladder-climbing robot and their tele-nurse robot, called TRINA, that will eventually be used to treat patients with infectious diseases. Dr. Patrick Codd, a neurosurgeon and director of the Brain Tool Laboratory, discussed how his lab was using surgical robotics to reach deep-seated tumors during surgery. Mary “Missy” Cummings also took the stage to speak about her own work as director of the Humans and Autonomy Lab, where lab members are studying automation in drones and driverless cars. 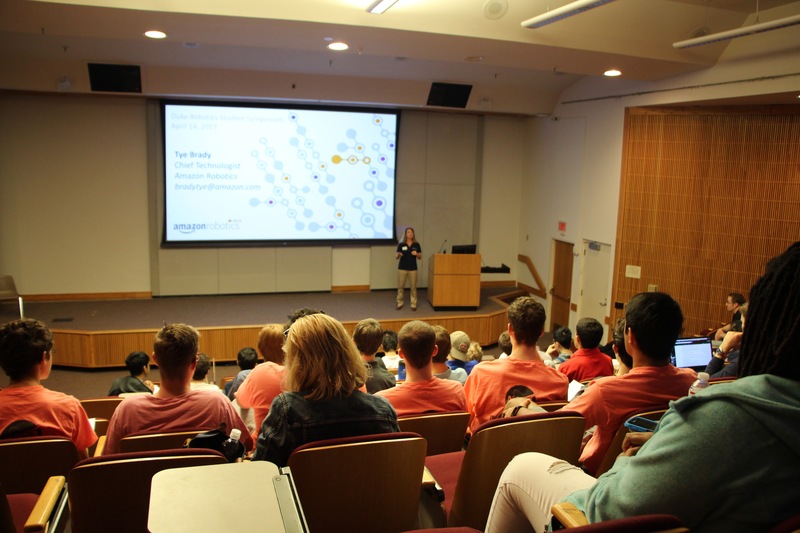 Although the event primarily featured talks from faculty and graduate student researchers, the high school students who attended the event also found ways to participate. 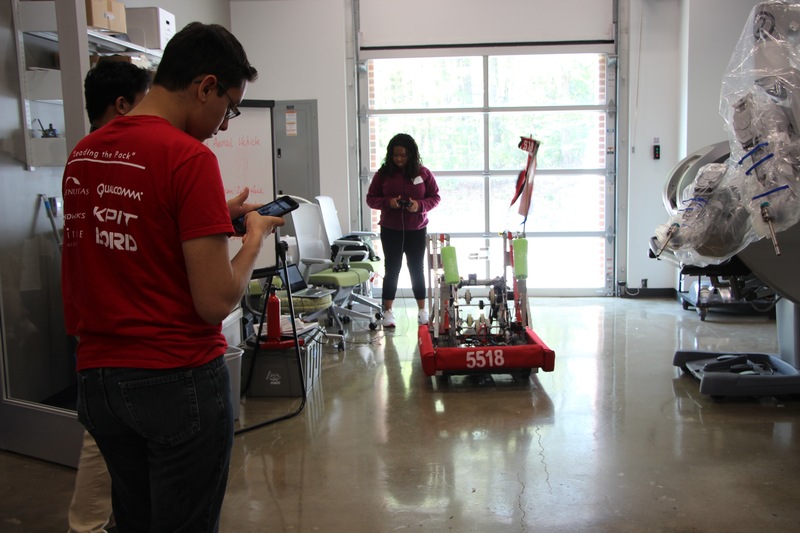 The Cary Academy FIRST Robotics team took the stage to discuss the robot they created for robotics competitions, and many other high school teams mingled with the graduate students and faculty during demonstrations.